Our next stop in our Canadian Maritimes journey was Cape Breton National Park. north of Ingonish Beach on the eastern coast of the cape. The rainy drive up on the Cabot Trail to Ingonish was interesting. with a couple of very steep grades that took us up into the clouds. One of the grades was so steep that it was 1st and 2nd gear up the hill. We did not get any pictures of our campsite. once the clouds parted we were out exploring and I just forgot. Here is a view out the front window of the bus from the GoPro. It gives you a decent overview of the place. I could get a view of the satellites. their CBS station which was carrying the Bronco/Bengals game on sunday. All sites in our loop were 50amp Full hookups, and about 75% long pull thrus. with no concerns about water useage. Saturday Morning we hit to road in the pickup to explore the cape. and eventually south into Cheticamp on the west coast. The Cabot Trail is world famous for it's scenery. There are numerous stops along the way to take in the vistas. since the pull-offs would be on your side and no crossing of traffic would be necessary. The road ribbons and snakes its way thru both mountains, forests, and sea-scapes. About 65 miles later we stopped at St Pierre's Catholic Church in Cheticamp. This area of the cape is mostly French speaking Acadians. The Parish was founded in 1785 and the present church constructed in 1893. It is one of a few stone churches, and certainly the largest, on the Cape. to Acadian Catholic churches over in Acadian New Brunswick. The beautiful interior is Baroque in style. A view from the second level by the organ. After visiting St Pierre's we made a u-turn and headed back to Broad Cove. Headed in the opposite direction always gives you a completely different view. Along the way we stopped at the Rusty Anchor in Pleasant Bay for lunch. My lobster and scallop stuffed wrap was fresh and delicious. After lunch it was back east over the highlands to the east shore and home. 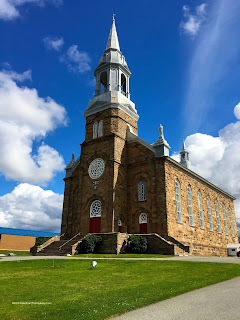 the cape - to St Pierre's Church in Cheticamp on the west side. It covers about 70 miles in 4 minutes and crosses up and over the central highlands enroute. We left Broad Cove on a mixed weather morning and headed south. Our destination was Five Islands, Nova Scotia on the west shore of the Bay of Fundy. dismal - calling for several days of cold weather and rain. The provincial park has no utilities. so we opted for the RV Park right down the road and on the water. Our site at Five Islands Ocean Resort. park had a great view with full hookups so it fit our needs. My 50amp connection had an open ground so I plugged into 30amp. we were back to just using the electric hookup. The view out the front window at sunset our first night. for 2 miles all the way out to the island in the distance. The water has returned... in more ways than one. satellites and gives up.... then starts again. We spent the rainy day inside. I was working and Kate enjoying the down day. Our next stop is Fundy National Park in New Brunswick. A super long pull thru with FHU and 50amp. And again - I am able to shoot between the trees and grab the 119° satellite. this year because already many trees are showing vibrant hues. The colors, plus the pines. and its fun to drive thru vast forests of Christmas trees. It must be something when covered with a fresh blanket of snow. 1) You can click on pictures to enlarge them. 2) On the upper right of the blog you can click on the map to see where we are and have been. Look for: "where are we today?" select a time range - that way you can see a map of the whole trip or longer. The photo below shows where to click when in the map. The final subject of this post will be Hopewell Rocks. its is truly a worthwhile visit. a platform with stairs that lead down to the seabed. in a single visit. We arrived about noon which was 30 min past high tide. From the platform near high tide. accessible. In 3 short hours the tide has receded about 15'. we left it was about 600' further out. By this time it was close to 4pm and we headed back to home. We stopped again at the Alma Harbor. wanted to get one a low tide. Can you tell which is high, and which is low tide? Our next and final stop in Canada will be Saint John New Brunswick. It is a short 90 minute drive from here and we will spend two nights. After that, it's back into the states and 4 nights at a KOA on the water in Bar Harbor, ME. there and in the Keys. Every once in a while we visit somewhere that is just really special. It could be some other quality that sets it apart. move ahead and travel onward..
in a struggle for control of North America. and both sides struggled to gain the upper hand. for the lucrative Cod fishery. and the Fortress was built around the town - the walls stretching over 2 1/2 miles. The fortress construction took place over a period of 25 years. At the time it was the most expensive and strongest fortification in the new world. he should be able to see the fort from Versailles. The town thrived within its walls and all seemed fine. and Lousibourg was a key component of that eventual defeat. the rich fishery of the Grand Banks. Louisbourg and destroyed the fortifications and the town. and bring back a piece of their history. All were gathered for this project that so far has lasted over 5 decades. From our home at the Cabot Trail KOA it was about an hour and 20 minute drive to Louisbourg. Arriving at the visitors center. allowed us to enter for free. in celebration of Canada's 150 year anniversary of Confederation. Our visits throughout Canada have already paid off the pass and we still have 20 months left! The Fortress is seen in the distance from the Visitors Center. Busses take you on a drive of perhaps 5 miles to the Fortress. The Kings Bastion. One of 5 that surrounded the town. The outer walls had cannons mounted. Looking inside the Bastion towards the ramparts where the cannon were placed. Inside the courtyard looking at the ramparts. The Chapel inside the Kings Bastion. Here the soldiers slept, cooked, ate, and played. It was their entire world. Contained within the Kings Bastion was also the Governors quarters. Here is the Governors dining room. The governor also had a slightly better sleeping arrangement than the rank and file. This room was where the town council would meet. Matters ranging from Municipal governance to judiciary took place here. The fortress was not just a fort - but a city where people worked and played. The fortress surrounded and protected the town. exacting details of the construction of the town and fortress. Government to reconstruct the town to exacting details. recreated in the rebuilding of the fortress. Those period furnishings that could not be found were recreated by craftsman. so the Canadian government retrained many of them in the skills required of an 18th century craftsman to reconstruct the fortress and town. The cost to do so must be enormous. Kudos to you Canada for your commitment to preserving your past! 18th century village would have looked like. were transported back in time. Waitresses in period costume served fare that would have been typical of the time. eaten with a pewter spoon. The meal was quite good and reasonably priced. of character but other than that, it was a step back in time. We stayed at the Cabot Trail KOA for 2 nights due to location. most likely have been fine. the electric as we will have FHU at our next stop too. The power worked fine and the hosts were friendly and led us to our site. Traveling east on TC-105 you come down a steep grade just before the park. Our view thru the windshield was across Bras d' Orr Lake. We did not have satellite due to the mountain behind the coach was blocking. people here in the campground. It's full hookup / 50amp service so we are running appliances with wild abandon. I selected this site (#55) with surgical precision to allow me to catch the satellites thru the trees. in that market Sunday, and their CBS station is on the 119° spotbeam which reaches up to here. this far north in this location. its all about getting it the way I want it. Its been raining hard all day so its Cozy time in the Bus. Saturday morning however has dawned clear and cool - a great day to drive the Cabot Trail. More from Cape Breton next time. Monday morning dawned foggy and with a steady rain. expose us to less of the elements. Enroute to Halifax we detoured towards Peggys Cove. Our first stop was the SwissAir Flight 111 Memorial. SwissAir Flight 111 was a scheduled flight from NYC to Geneva. off of Peggys Cove in Sept 1998 resulting in the loss of all 229 people on board. The view of the memorial as you walk the trail. rescue effort and the tragedy had a profound impact on the local communities. Looking out to sea towards where the flight went down. Leaving the memorial, the somber weather matched our mood. Our next stop was the iconic Peggys Cove. One of the most picturesque fishing villages along the Nova Scotia Coast. A lighthouse marks the rocks at the head of land. Staying with the somber visitations of the day, our next stop was the Fairview Cemetery in Halifax. It was here that 120 of the victims of the Titanic found their final resting place. and the fleet of Telegraph ships were based here. to try and retrieve as many bodies as possible. too badly decomposed or without any identification so they were wrapped and buried at sea. 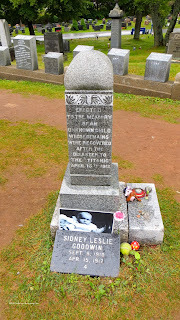 120 of the Titanics deceased were burried at Fairview Cemetery. The White Star Line purchased the plot below for the graves. The headstones are arranged to form a bow of a ship. Each body was given a number and a simple headstone. Some family then placed larger headstones. As bodies were later identified, the name was added to the stones. 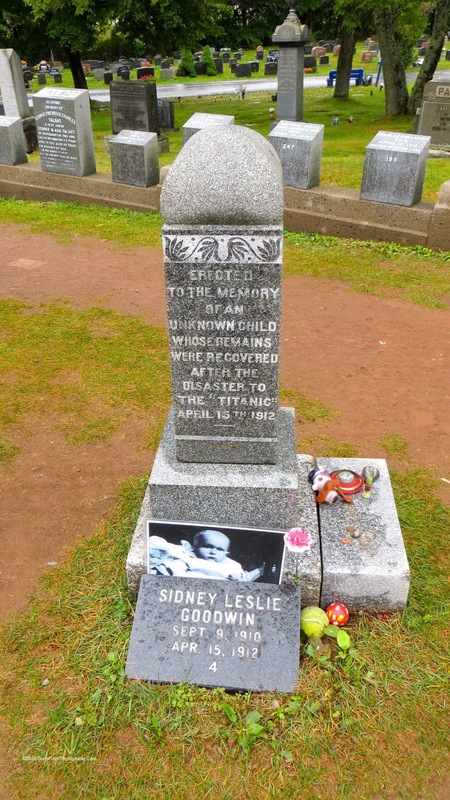 identify him thru DNA as Sidney Goodwin - aged 19 months. (8 total) had perished in the disaster and were never recovered. Another interesting headstone is that of body # 239 Ernest Freeman. White Star Chairman J Bruce Ismay during the voyage. Ismay - who survived to his eternal shame - paid to have this stone erected. Below - the stone of Alma Paulson. Her husband, Nils, was a miner in Sweden who emigrated to the US before his family. for his family to join him and booked passage. His wife and all 4 children perished that cold April night. Below - a stone of an unknown. 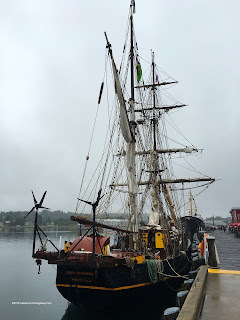 We had hoped to visit the Halifax Maritime Museum but we ran out of time. the recovery efforts but this will have to wait for another day. Our day concluded, we returned to the bus for the night. to spend an afternoon visiting Lunenburg, an easy 30 minute drive from the park. St Andrews Anglican Church was a worthwhile stop. Above the altar the ceiling had stars painted on the ceiling. Some other views around town. We eventually made it down to the docks. Strolled thru the Museum and walked the piers. The Lunenburg Academy Occupies the high spot in town at the top of Gallows Hill. Academy Building left in Canada. Leaving town I had forgotten to get a picture of a "Lunenburg Bump"
the entryway can be found in many shapes. Round, Square, Hexagonal. pressures are going to move us on. this post that I began 2 days ago.